7 days from £3100pp plus international flights. An exciting 3-centre safari offering beautiful scenery and wildlife viewing on land and by water, combining to create a memorable safari. With high quality accommodation and excellent service, you'll be very well looked after throughout. Add to this the fact that by taking this holiday you're making an invaluable contribution Botswana's rhino conservation programme, and this is a very special and worthwhile holiday. The African rhino faces an uncertain future. The black rhino is classified as critically endangered and the white rhino as near threatened. 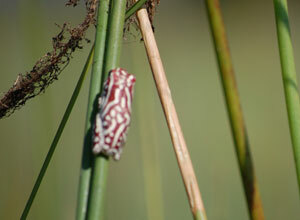 Vital conservation work is being carried out in a number of countries including Botswana. This trip includes a donation to this important work to protect rhinos. You'll take game drives in the Makgadikgadi Pans National Park, float through the waterways of the Okavango Delta in a traditional mokoro, and take boat rides on the Chobe River, all providing excellent wildlife watching opportunities. Flying between lodges and camps makes the most of your time letting you spend longer on safari in each location. 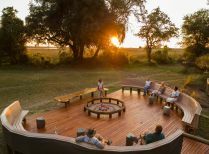 You'll start the holiday at Leroo La Tau, on the banks of the Boteti River bordering the Makgadikgadi National Park, and have a choice of 4 camps and lodges in the Okavango, ending at either Chobe Game Lodge or Savute Safari Lodge, allowing you to select the accommodation that most appeals to you. All offer similar facilities such as pools, viewing decks and spacious rooms, and are staffed by friendly local people who provide efficient and professional service. NOTE: Whilst this trip is backing rhino conservation with funds, we can't guarantee you will see a rhino. 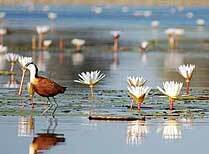 It is a generally superb Botswana wildlife trip. You'll be met on arrival in Maun and assisted to the plane for the short flight to Leroo La Tau near Makgadikgadi National Park. Depending on your arrival time you'll set out on a game drive to explore the area around the camp. Your guide will help you spot wildlife such as bushbuck, kudu, impala, zebra, wildebeest and lion. After this exciting safari you'll return to camp for drinks by the campfire and a delicious dinner. Dinner. 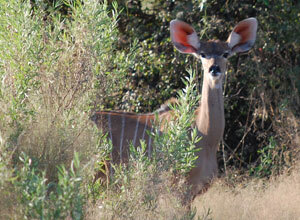 This morning you head out into the bush to see animals at the start of the day. As well as the more commonly seen game, you might catch sight of the rare white rhino, whose population in Botswana currently numbers around 60 but is, thanks to conservation efforts, on the increase. You return to the camp for lunch and time to rest, maybe enjoying a dip in the pool. In the afternoon you might opt for a boat safari (water levels permitting) or watch wildlife from the hide built into the riverbank. The camp offers night drives, so you'll have the chance to look for nocturnal species, if you wish. Breakfast, lunch, dinner. 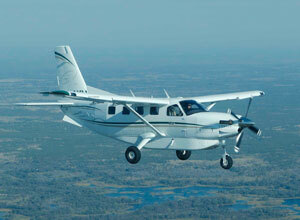 Today you'll fly to the world-famous Okavango Delta and the camp of your choice. 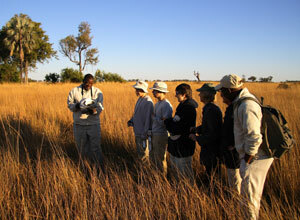 You'll be introduced to your guide before you set off on a safari to experience the rich flora and fauna of the delta. Depending on your camp's location you'll explore by land or water, both equally rewarding and you're sure to have a thoroughly absorbing time. Keep your camera to hand to capture those precious encounters! This evening you can chat to fellow travellers over dinner before you retire to bed for a good night's sleep. Breakfast, lunch, dinner. A full day to enjoy all the delta has to offer. A mokoro ride is the iconic way to experience the waterways and lagoon. Sit back as your poler guides the mokoro through the water, and enjoy the scenery, looking out for delicate reed frogs and birds, as well as game on the banks. Lunch is served in camp, and in the late afternoon, after the heat has abated, you'll set off again to enjoy the delta scenery and wildlife. You return to the camp for dinner, and later you can sip a nightcap sitting by the campfire while recalling the day's highlights. Breakfast, lunch, dinner. Today you bid the Okavango Delta farewell as you fly to Chobe, the final destination on this safari. You're staying at the only permanent lodge in the national park, perfectly positioned for wildlife viewing by both 4x4 and boat. 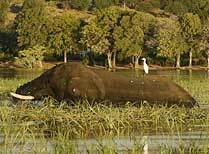 Chobe is known for the vast elephant herds often found near the river, and you can also hope to see sable, red lechwe, giraffe, lion and wild dog, as well as many species of birds. Chobe Game Lodge is unusual in that it has an all-female guiding team, and they take great pride in showing your their park's riches. Breakfast, lunch, dinner. You have a choice how to spend your day. 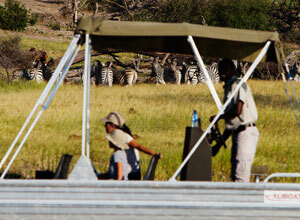 The lodge offers morning and afternoon game drives, plus leisurely boat safaris early in the day and again at sunset. A mix of both ensures you'll have a comprehensive safari, observing the region from different perspectives. In the middle of day you can relax at the lodge, sitting on one of the shaded decks taking in views of the Chobe River, or cooling off with a swim in the pool. Later you'll dine in the boma, as you look back on all that you've seen and done over the last few days. Breakfast, lunch, dinner. After breakfast, bags packed, you'll board the flight bound for Maun, where your holiday ends. Breakfast. Price notes: 2019 guide price pp sharing, from: Jan-Mar and Dec 2019 £3100; Apr-Jun and Nov £3770; Jul-Oct £4930. 6 nights accommodation on a twin-share basis; meals as specified; soft drinks, local spirits and wines; daily safari activities; domestic flights Maun to Leroo La Tau, Leroo La Tau to the Okavango Delta, the Okavango Delta to Chobe and Chobe to Maun; transfers as specified; national park fees and all government levies and taxes; emergency medical evacuation insurance. International flights and taxes; visas; travel insurance; premium and imported drinks; tips; items of a personal nature. This holiday starts and ends in Maun. From the UK, we recommend getting a flight with British Airways or South African Airways via Johannnesburg. These will cost from around £1200 per person, according to season and availability. We usually book these flights for you. Departure dates: This is a tailor-made itinerary which operates all year round can begin on the day of your choice. 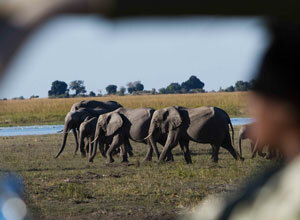 Chobe, in northern Botswana, is known for its huge herds of elephants attracted by the river. Savuti’s arid landscape is quenched by the seasonal Savuti Channel, making it a highlight for big game. The famous Okavango Delta with the Moremi Wildlife Reserve at its heart, is the jewel of Botswana, and one of the best wildlife reserves in Africa. A 12-tent camp facing Xakanaxa Lagoon in the game-rich Moremi Game Reserve, with spacious social areas and a swimming pool. 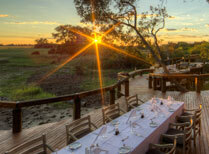 Set in the heart of the delta, Camp Okavango provides high quality accommodation and water-based safari activities. 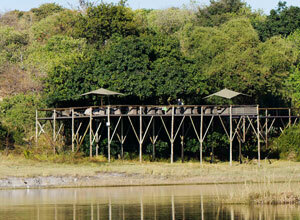 The only luxury lodge in Chobe National Park, with a prime position by the river. 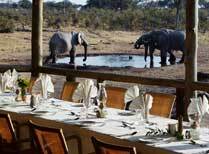 Leroo La Tau is set above a waterhole in the Makgadikgadi Pans with great views and superb game viewing. 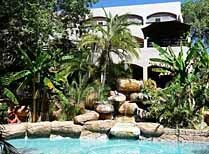 12-room lodge overlooking the Savute Channel providing game drives and comfortable accommodation. 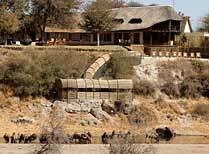 This is a gorgeous tented camp on a waterside location in the game rich Moremi Game Reserve. 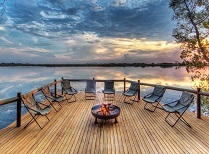 Xugana Island Lodge is a small lodge set next to a lagoon in a private concession in the famous Okavango Delta. Botswana only has about 60 rhinos left in the whole country. Help is desperately needed to protect the current population and increase numbers through translocation and breeding projects. This trip includes a donation to the Botswana Rhino Relocation and Re-introduction Programme. 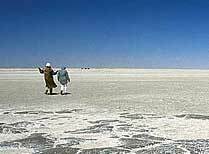 This trip is an excellent 6-night safari taking in the Makgadikgadi National Park, the Okavango Delta and Chobe. 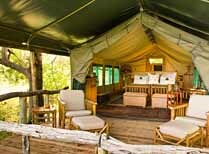 It uses lodges run by Desert & Delta Safaris and the catalyst for this trip was the lodge called Leroo La Tau. Two female rhinos were found to have walked here from Moremi in the Okavango Delta and have since bred in the area. The company pledged to help back their protection. You will be seeing amazing wildlife, but it’s quite possible that you won’t see a rhino on this trip. However you will definitely be helping rhino conservation through buying the safari.